This article is a review of THE REACH a.k.a. BEYOND THE REACH. There is something so 1980s about THE REACH: High concept muscularity with a weak, conventional ending. Ronny Cox (BEVERLEY HILLS COP, ROBOCOP) is even in it. 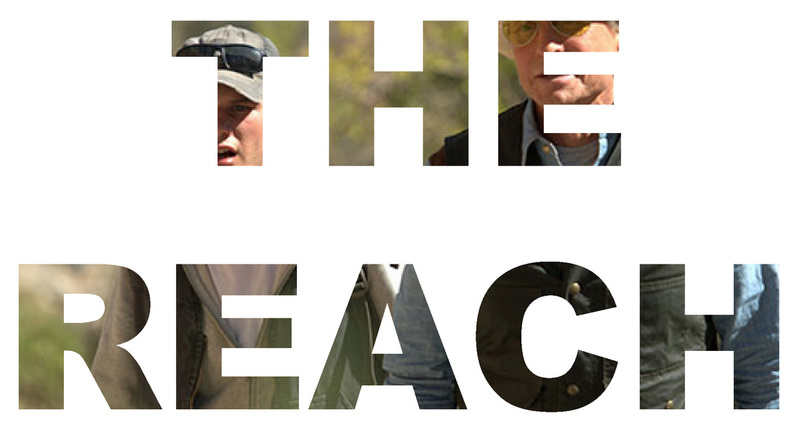 Michael Douglas brings charisma to his always engagingly flawed American male. As John Madec he is not quite as wealthy as his Nicholas Van Orton, in THE GAME, but he is in the process of negotiating a deal worth $120 million. In the Mojave Desert, Douglas’ insurance corporate captain is an outdoorsy Gordon Gekko (WALL STREET, natch), out in the middle of nowhere to hunt game. Opening on an attention-grabbing dream, Ben (Jeremy Irvine – THE RAILWAY MAN) is running in the desert in just his underpants. We’ve all had that one right? Waking up next to girlfriend Elena (Hanna Mangan Lawrence – SPARTACUS: WAR OF THE DAMNED), is it in fact a premonition? (Clue: It is.) Relationship problems are briskly conveyed: Elena is off to university in Denver, while Ben stubbornly remains in his family’s search and rescue business, now his own, as a guide. A tough farewell, suggests they just have each other. No time to grieve, Sheriff J, Robb (Cox) has a job for Ben to take Madec out to the Reach, the most hazardous part of the desert, and babysit him. In an undeveloped aside, local dogs have gone missing. Is coyote blame meant to add to potential future dangers? Ben is called the best tracker in the county, maybe even the state – stakes are too obviously being set out early. In a stunning truck, looking like an elongated armoured car used to transport bank deposits, Madec has arrived prepared. It cost $500,000 plus tax, he states. The vehicle even comes equipped with an oven and an espresso machine. Handy. His sat-phone has “full terrestrial coverage”. Cocky, brash and loquacious, Madec has managed to acquire out of season special permission to hunt early. The landscape is inhospitable enough to be MAD MAX apocalyptic. Madec even makes a WALL.E impression. Pixar harnessed to bond in a chase thriller. Potential was here. Plot mechanics gear up when Madec accidentally kills a local in the dazzling sunlight, and sets Ben up for the shooting. Instead of just killing his guide, Madec sends him out into the wilderness in just his boxers. Premonition alert! What should have been exhilaratingly tense, in the vein of ’71 or APOCALYPTO, never finds the levels required. Allusion to the callous amorality of capitalism, where the poor are liable for the misdeeds of the wealthy, is not cleverly woven into the narrative. After the undernourished GHOST AND THE DARKNESS, perhaps Michael Douglas should stay away from big game unless he is in David Fincher’s hands?